From atop the Mount of Olives I surveyed the Holy city of Jerusalem in all its glory. Directly below me, white marble caskets in the Jewish cemetery tumbled down the hillside like giant rows of dominoes. We picked our way through the graveyard as our tour guide explained that a spot in this cemetery may be the most expensive real estate in the world. “Tradition holds that those who are buried here will be the first to be resurrected when the Messiah appears, so Jews from all over the world pay thousands of dollars for one of these tiny plots.” The price of eternity, however, is escalating. The Mount of Olives cemetery is fast running out of space. There are 122,000 known graves and the cemetery is 83% full. Today burial site costs a minimum of $20,000, and some sell for more than $50,000. At the bottom of the hill our guide led us to the Garden of Gethsemane, a grove of olive trees which Jesus was said to frequent. “This is believed to be the place where Jesus prayed the night before his crucifixion,” he explained. Catholics consider it the first Station of the Cross. However, like much of the narrative surrounding the historic sites of Jerusalem, there is no consensus. 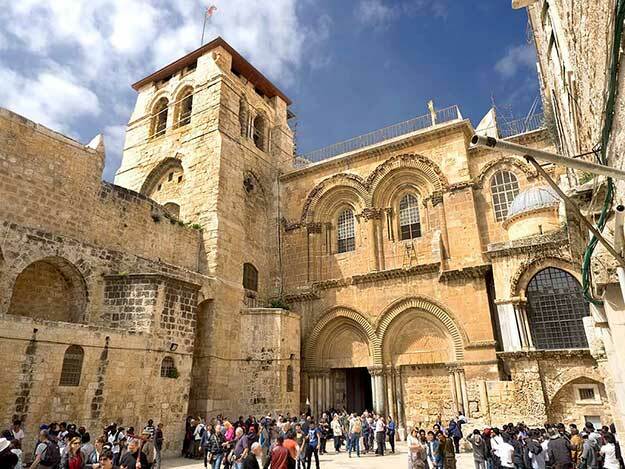 Among other places, the Church of All Nations, located next to the Garden of Gethsemane, and the Tomb of the Virgin Mary both claim to be the locations where Jesus prayed on the night he was betrayed. A short distance away we stopped briefly in front of Mary’s Tomb. Our guide waffled less about this site than others. “Most believe that this is where Mary was buried.” Yet even this is disputed. Some legends claim she was buried in Mary, Turkmenistan, while still others insist she was entombed in Ephesus, Turkey. By the time we walked through Lion’s Gate into the original, walled city of Old Jerusalem, my head was spinning from the ambiguities. But I would soon learn they were just the tip of the iceberg. Golgotha was nearby, but it certainly wasn’t what I expected. The hill, which in most biblical scenes is depicted as a barren mound with crosses scattered across its summit, was nowhere to be seen. In its place stood the Church of the Holy Sepulchre. In AD 325, the first Christian emperor, Constantine the Great, ordered the church built. Today it is largely accepted that it was constructed around Golgotha hill and over the tomb where Jesus was buried and resurrected. More than any other place I’ve visited, the commentary of Jerusalem was awash with disclaimers. Again and again, I heard statements like, “In Jerusalem, it is said that…legend has it that…people believe that…and, many say that.” Information is provided in terms of probabilities and possibilities, rather than facts. I was intrigued. Like a curious adolescent, I wanted to know why. Prior to arriving in Jerusalem, my knowledge about Israel was limited. I knew that in 1947, the United Nations voted to approve Resolution 181, which partitioned Palestine and created the Jewish state of Israel. I was slightly more informed about the decades since partition, but even this knowledge was riddled with gaps. As for the ancient history of the region, I knew virtually nothing. And so I began to educate myself. I picked the brain of the owners of my guest house, Avital Hotel, and had deep discussions with Jews and Palestinians in cafes. I read everything I could get my hands on regarding the history of this region of the Middle East. History provided my answer. In AD 132, Jews became incensed when the occupying Roman Emperor Hadrian prohibited the practice of circumcision. Having fought and lost a devastating war against the Romans in AD 70, Jews might have buckled to this decree. But in a move that could only be seen as a desecration, Hadrian reneged on his promise to rebuild the destroyed Temple Mount and instead replaced it with a shrine to the Roman god Jupiter. The resulting war, known as the Second Jewish Revolt, lasted four years and killed more than a half-million Jews. Though victorious, Hadrian had suffered immense losses as well. Furious, he was determined to wipe any memory of the area known as Judea from the Jewish consciousness. He renamed the entire region Syria Palaestina, a name which has come down to us as Palestine. He also renamed the city of Jerusalem to Aelia Capitolina, then banned all Jews from Jerusalem under penalty of death. And so, as I continued my exploration of the Holy City of Jerusalem, I began to take things on faith. If you are a Muslim, you believe that the Prophet Muhammad ascended to heaven from Temple Mount, conversed with God, and returned to inspire his followers. If you are Christian or Jewish, you believe that the stone inside the Dome of the Rock is the place where Abraham was ordered by God to sacrifice his son Isaac. Druze, Samaritans, Bahá’í, Coptic Christians, Ethiopian Christians, and Armenians all believe that miracles of faith occurred in this ancient city. And almost everyone chooses to believe that if you write a prayer on a slip of paper and shove it into a crack in the Western Wall, your prayer will be granted (though there is no guarantee when it will be granted). Like everyone else, I descended to the wall and left my note. After spending two weeks in Jerusalem and a month in research, I was better informed but far from an expert. We may never know the exact spot where Jesus suffered on the cross, or where the Virgin Mary was born, raised, and died. Until the end of days, we can’t know for certain if the souls buried in the Jewish cemetery on the slopes of the Mount of Olives have ensured their resurrection. However, I do know one thing for certain. Visiting the Holy City of Jerusalem is all about faith. 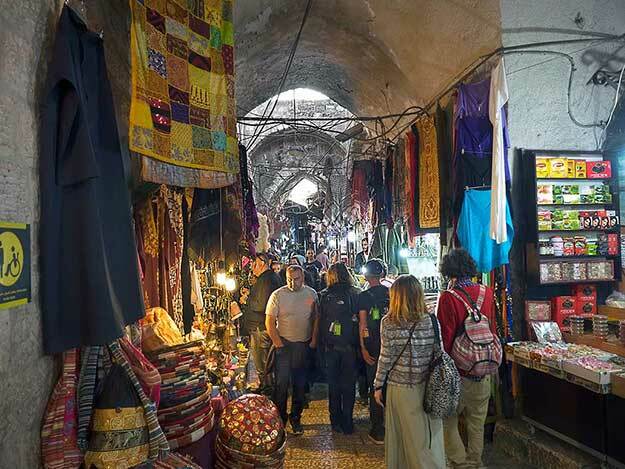 Check prices for accommodations in Jerusalem at Booking.com, Hotels.com, or HotelsCombined.com. Read reviews about hotels and guest houses in Jerusalem, Israel at TripAdvisor. Disclosure: The above article contains affiliate links. If you click on any of these links and subsequently make a purchase, I may earn a small commission, which helps keep this blog free for you to use. I also wish to thank Sandeman’s New Europe, which provided my excellent walking tour of the Mount of Olives and the Old City of Jerusalem. Awesome Blog! Thanks for sharing this information about JERUSALEM. You’re very welcome, Nitin. Happy that you enjoyed my article. Hi. Love reading your travel blogs. My husband and I had a great tour of Israel given by two Palestinian guides. One Christian and the other Muslim. Our guide found us a different burial place for Jesus aside from the one under the huge dome in Holy Sephulchre Church. It was still inside the wall of the church but a cave which has archiologists interested as they have found ancient tunnels coming into the cave from outside and also items suggesting pilgrims visited here in very early times. As for the traditions and the lack on ongoing people to authenticate the places, most of the Jewish people might not have wanted to preserve where Jesus walked etc, unless they were of course the descendants of many of the people who became Christians in those early days. Most of those of course actually stayed behind. At least the Samaratins did and also when a travel guide Rick Steves asked a Palestinian family about their Christian faith, they said , People ask us when we became Christinas. Our answer is: 2000years ago, when our ancestors saw the disciple and Jesus. So some, stayed but may not have had access or priority to preserve sites. The Franciscans have been in Israel for centuries, since early middle ages, so they too have had time to research sites. They are the official guardians of Christian sites. I loved the Palestinian people I met. Some of the Jewish people were lovely too, but the youth blazing around with guns etc, put me off a bit. One of the beautiful sites we visited and well worth it was the Hollocaust museum. Our group took an extra hour to come out and we were still only half way through. The whole middle east, Israeli Palestine situation is complex. There is fault on both sides. I didnt know non Jewish people could put prayers in the spaces. I just watched from the womens side for a while, swapping over the camera to my husband to record images from the mens side. As for Mary she definitely died in Turkey near Ephesus. And there cannot find a burial site, but Catholics would say they know why. Again tradition but believed from the first or second century. So it has legs so to speak. Keep on travelling and exploring and always being true to yourself and not taking sides. That is true travelling. Hi Leonie! I’m so happy you enjoy my stories (and I appreciate that you understand I take great pains not to take sides :-)). As you discovered during your visit to Israel, it is a very complex country, and even with a two-week stay, I barely scratched the surface. I think it would take months, maybe even years, to have even close to a complete understanding of the situation there. But one thing is for sure; it’s a fascinating place to visit. You learned the Ashkena?i version of history. Jews and Christians co-existed with others as tribes. Why is it that one tribe claims Palestine and the others are excluded? Abraham and Isaac were not Jews and never knew what Judaism was. So again, your “facts” isbthe Ashkena?i Israeli version that seeks to justify their ethnic cleansing of Palestine. Go educate yourself by reading Dr. Shlomo Sand and Ilan Pappe books and research. They’re both Israeli. Hi. I had to research the meaning of Ashkena. I am guessing these are people who became settled eventually in the eastern Europe geographical areas, having begun in the middle East. I travelled in Israel and Jordan on a secular tour in 2015, having Muslim guides in Jordan and Israel and Palestine and a Christian driver in Israel Palestine. So if we got biased views it was certainly not Jewish ones. I loved our tour, and we got to see more, because our guides in Israel /Palestine were able to come across to all the sites. Our guides were Palestinian in ethnicity and also Israeli citizens as much as that is allowed ( less rights than other Israeli citizens for sure). I disagree with you that Abraham and Isaac were not Jewish. In that of course there had been no 10 commandments or escape from Egypt, but they were the beginning of what was promised by God to be a whole nation more numerous than the sands . The Jewish people, who then constantly disobeyed God and had to learn again to trust and follow him in a world where believing in One God was very foreign. So easily swayed by others. Jewish and Christian and Muslim peoples in Palestine as it became known did co exist quite happily for centuries off and on. And I think it is not the Ashkena view of history that seeks to establish a Jewish only country, but maybe those who have far less religious reasons than just plain empire building. I think both sides have that problem in some way. You are right in saying that the whole thing is far more complex than is believed. I happen to be appalled at the depth of intrusion into Palestine by the walled city settlements. but also appalled at those who fight back with violence thinking this will help. It only disenchants those who want to see justice and gives ammunition to the wrong thinkers.